Enterprise Connect 2019 was held at the Gaylord Palms Hotel & Convention Center in Kissimmee, FL, United States on March 18-21, 2019. Enterprise Connect is the largest independent event devoted to all things enterprise communications and collaboration. Enterprise Connect is a conference and exhibition dedicated to the latest software, systems, applications and services for enterprise. The Leading Enterprise Communication Event was designed with one objective in mind: to help the attendees to maximize their investments in communications and collaboration systems, software and services. The conference program included roughly sixty breakout sessions led by industry experts including many thought leaders such as Brent Kelly, of KelCor; Zeus Kerravala, of ZK Research; Kevin Kieller, of enableUC; Sheila McGee-Smith, of McGee-Smith Analytics; Marty Parker, with Communication Perspectives; and Melissa Swartz, of Swartz Consulting. These sessions allowed the attendees to come away from the event with loads of in-depth, objective insights across nine technology tracks to take back to our offices and put to use in crafting our communications and collaboration strategies. The keynote lineup featured Pasquale DeMaio, GM of Amazon Connect at Amazon Web Services; Amy Chang, SVP of Cisco’s Collaboration Technology Group; and Lori Wright, GM of Microsoft 365 at Microsoft. During these keynotes, attendees learned about the latest technologies and strategic thinking from core vendors. Enterprise Connect brought scores — close to 200! — of communications and collaboration vendors, large and small, to a technology-packed expo hall. There were extended exhibition hours this year, so everyone had plenty of time to visit all of the booths! For more than 28 years, Enterprise Connect has been the leading conference and exhibition for communications. 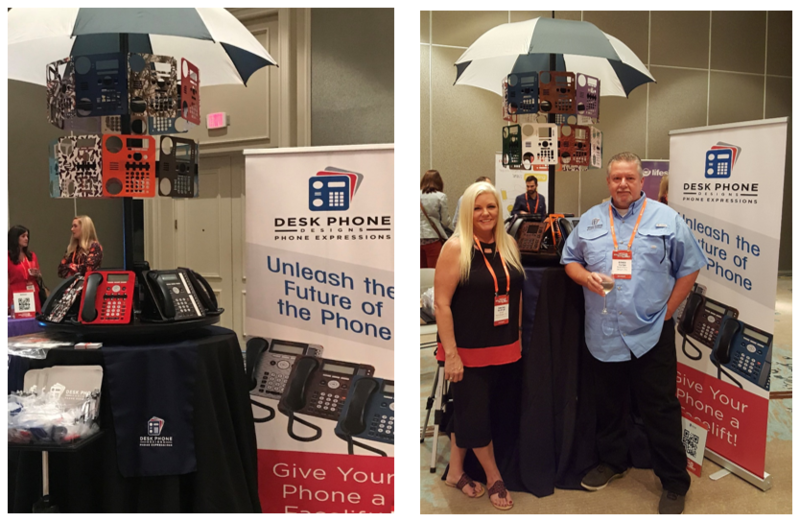 Desk Phone Designs was very excited to join this world-class event to showcase our innovative new product. With that said, we would like to thank everyone who visited the Desk Phone Designs booth. We were overwhelmed by the positive feedback from the visitors to our booth regarding our snap on phone covers. Enterprise Connect 2019 is over and was a huge success! The DPD team can’t wait until next year’s event to showcase our custom covers with additional phone models/manufacturers. Super9 Convergence was a three day conference where Super9 alum, their teams and Intelisys Sales Partners gathered for education, tech deep dives, peer group meetings, and networking. Intelisys is leading the way as its Sales Partners make the pivot and experience the shift away from traditional telco services into a new era of cloud-based solutions. 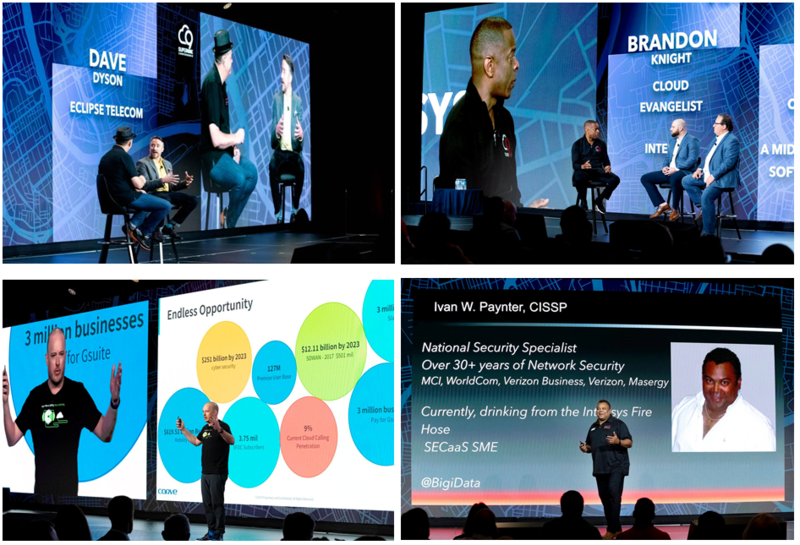 The biggest Super9 event to date was designed to bring the Intelisys and ScanSource Partner communities together, converging around the central theme of accelerating the growth of Sales Partners’ cloud business. This year’s all new “Voice of the Customer” content focused on new and innovative ways to solve real-world customer challenges, and how to use technology to address every aspect of our customers’ current and evolving needs. 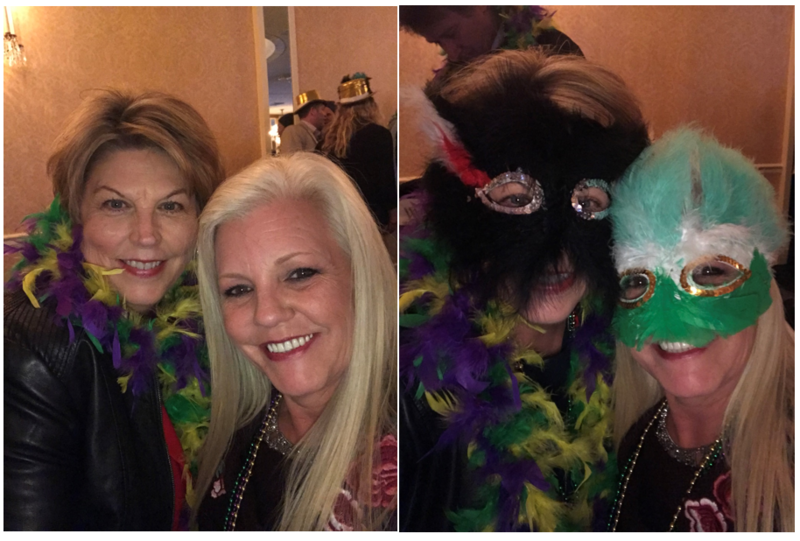 Torina Boatright, Avatel’s VP of Operations and a Super9 Alumni, had an incredible time in Nashville at Super9Convergence! It really was a fantastic opportunity to build rewarding connections and experience world-class educational content, fantastic music, and an authentic Nashville experience. 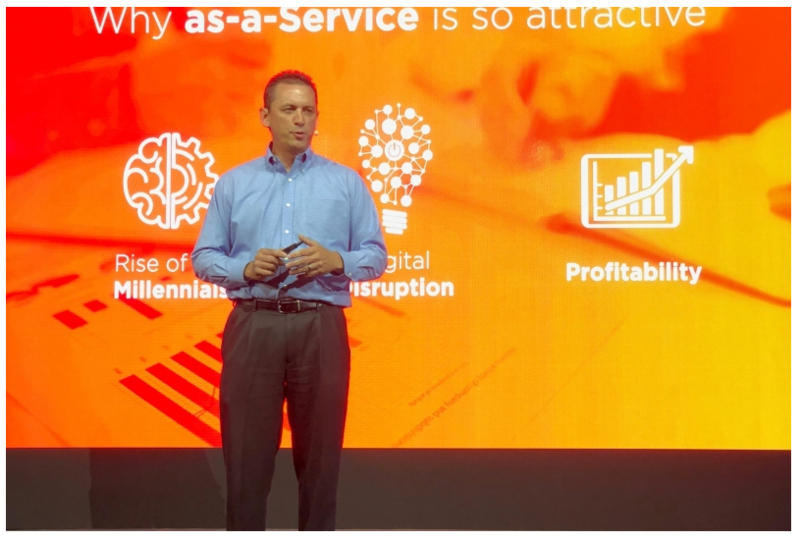 Andrew Pryfogle, Intelisys SVP Cloud Transformation, opened the event with a look into the evolution of technology, the critical role cloud plays in CX, and how it is driving the convergence of the telecom and IT channels. There were incredible keynote presentations from experts in the channel and in sales, including Matthew Dixon, author of The Challenger Customer, who shared a roadmap for engaging hidden influencers in our customers’ organizations, and how to leverage these “Challenger customers” to create buy-in. Matthew discussed how to identify and engage those hidden influencers, tailor sales conversations, navigate cloud sales more effectively, and take our deals to the finish line. Not only did Torina enjoy the presentation, she bought the book to bring back and share with the Avatel staff. Michael Sterl, Co-Founder and CEO of Carve Digital and Cloud Optik, examined the endless opportunity in the marketplace as Sales Partners transform into next generation solutions providers. Sales Partner Dave Dyson, Eclipse Telecom’s Chief Communications Strategist, discussed the huge window of transformation and opportunity in the channel, selling against the status quo, challenging our customers, and more with Intelisys’ SVP Cloud Transformation, Andrew Pryfogle. Cloud Evangelist Brandon Knight delivered practical, actionable content to meet the burgeoning demand for cloud education from Intelisys Sales Partners. Brandon adds a unique and important voice to the conversation around cloud. His ability to connect with Sales Partners, and clearly communicate technical ideas that Partners can apply right away helps transform their cloud practices and move the needle. “We’ve seen enormous growth in the cloud industry, and with it has come an insatiable appetite for knowledge from our Sales Partner community,” said Pryfogle. “As Cloud Evangelist, Brandon adds a unique and important voice to the conversation around cloud. His ability to connect with Sales Partners, and clearly communicate technical ideas that Partners can apply right away. Ivan Paynter, Intelisys’ National Security Specialist, shared the top reasons security has moved beyond firewall, provided a list of questions to start conversations with our customers, and dove deeper into security in a short Q&A session with Andrew Pryfogle. By attending this world-class event, Avatel had insider access to 40+ industry-leading cloud and carrier service providers. The conference offered twenty-four targeted, deep dive Education Breakout Sessions that delivered new and innovative ways to solve customer challenges and open new opportunities for our business. There was personalized, sales focused, hands-on guidance from our top-performing peers and the smartest minds in the channel in an interactive and highly effective learning environment. Everyone enjoyed all that “Music City” had to offer at Super9 Convergence, including Tennessee’s famous world-class ribs from the finest BBQ restaurants in the country, to line dancing to awesome live music. 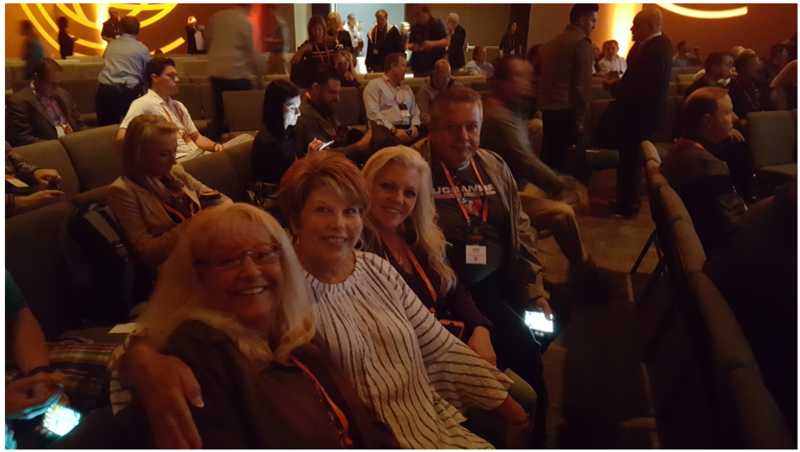 Another great time at Super9, the only event solely dedicated to developing the channel’s greatest sales experts and leaders. Avaya just capped off its biggest ever conference, bringing more than 2,500 attendees, including partners and customers, to Austin, Texas. The theme of the event was “Experiences that Matter.” It included 100 expo partners, sponsors and exhibitors. We were so excited that both of our companies were represented, Avatel as an Avaya Business Partner and Desk Phones Designs as a Vendor at the Engage Solutions Expo. 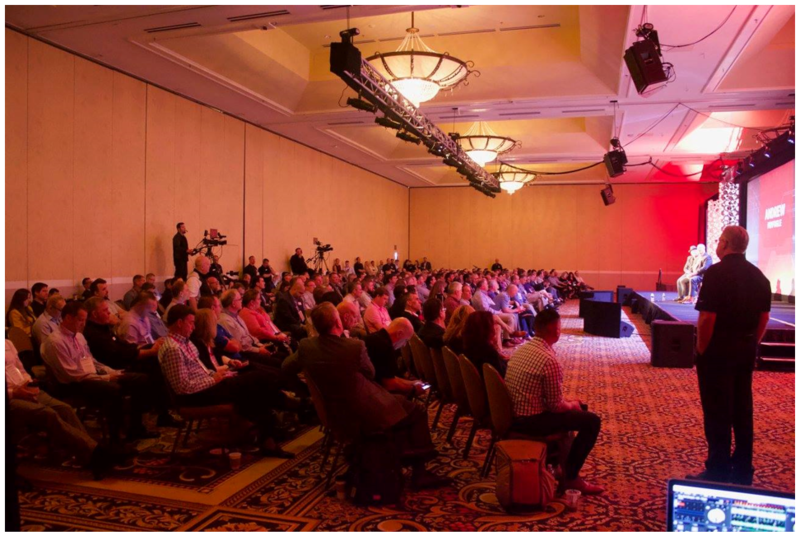 Avaya opened its annual Avaya Engage conference, for the world’s largest community of contact center and unified communications users, and introduced new innovations to simplify and enhance converged business communications. Avaya Engage was hosted by Avaya and the International Avaya Users Group (IAUG). The Engage Conference and the Solutions Expo is the premier event for the future of communications experience and its impact on digital transformation. 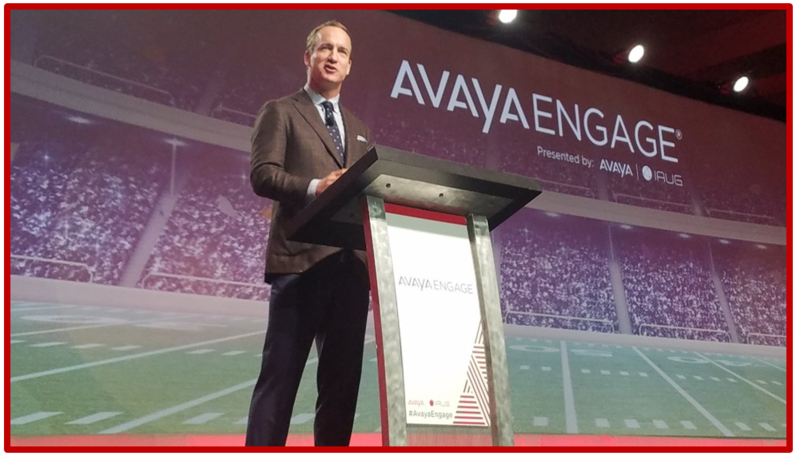 Avaya Engage 2019 brought four days of general sessions, workshops, and breakouts; inspirational and informative speakers; and content experts to drive and enhance our digital transformation journey. 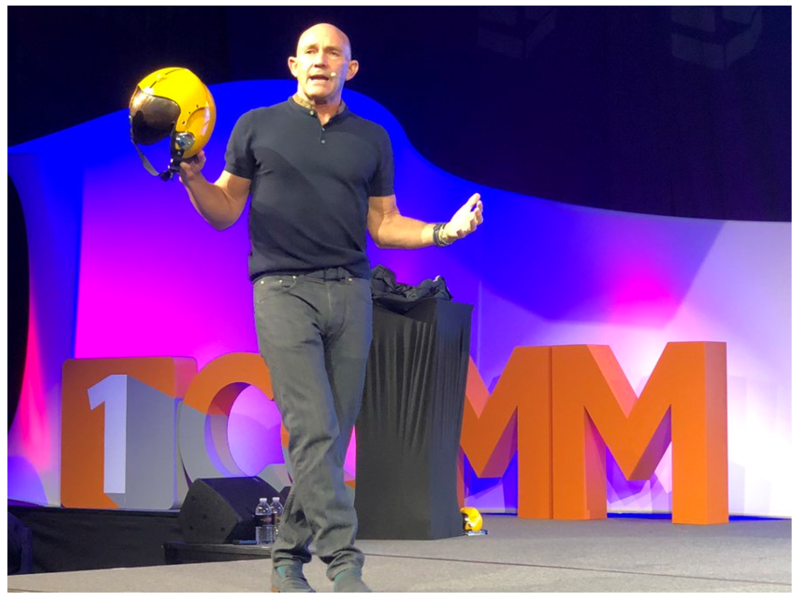 This year’s keynote speakers included Jim Chirico, president and CEO, Avaya, and Payton Manning, two-time Super Bowl-winning quarterback and five-time NFL MVP. Avaya ENGAGE was a premier event for Avaya customers and resellers, with the primary focus being to learn about new Avaya products and to network with peers. However, Engage is also the place to hear from Avaya’s executives about the state of the company. President and CEO Jim Chirico said, 2018 was the first chapter of improving the company’s trajectory as a business. He told attendees that Avaya would “provide you ways to further differentiate yourself,” and that Avaya has been a leader of change and technology advancements for more than 100 years. Avaya’s key messages are: being customer-led in everything it does; simplification, including streamlining its solutions portfolio; and converging unified communications (UC) and contact center (CC). Continuing its investment in its core UC and CC, including leveraging new technologies with partners. Providing breadth and depth around its cloud. Emphasizing its services capabilities, including helping organizations transition to cloud and accelerating value for technology investments. In a Q&A with Channel Futures, Gary Levy talks about new opportunities for partners and what he’s hearing from them about the company’s continuing transition. He says, what’s important when you look at the partner community is, at Avaya we talk about experiences that matter. For me, it’s the partners that matter and the experiences they bring to us, and the experiences they have brought to us through the years. So I think what’s important for them is they’ve got customers who rely on them as their trusted adviser. That customer has done a tremendous amount of business with them over the years and they have a relationship, and the partners maybe in the past have felt that there was a limited conversation that they could have with the customers. Today and over the last year, through evolving both mobile experience and now the One Cloud offer, they’re changing the conversation with those customers. I think it’s important that the customers continue to see those partners as an extension of Avaya, but also an extension of their ecosystems and provide customer experiences as well. Gary was asked – What’s the overall message for partners here at Engage? He said, I think most importantly is that the partners have seen that we’ve continued to evolve and they’ve seen that year over year, not only in our offers, but mostly in our programs. Our programs have evolved – with the new Edge program – but there’s a huge opportunity for the partners to earn, opportunities around new customers, new contact-center seats as well as cloud. Cloud is so prevalent now for us and our partners. But mostly it’s the message around simplicity for them as we evolve the programs, and that we continue to innovate around their needs, because the partners are who’s driving the feedback from customers to us. That’s why they’re so important to us. The Experience Theater at Avaya Engage Solutions Expo provided content experts to drive and enhance the digital transformation journey. In today’s constantly evolving digital environment, businesses need fast and easy access to holistic customer data to drive customer loyalty, revenue and smarter decision making. The Experience Theater sessions focused on creating a seamless digital customer experience while maximizing existing investments and empowering the workforce with new tools and capabilities leveraging interaction data. Content included shared examples of how attendees can achieve consistency and increased satisfaction across all customer touch points in a digital experience. Focused specifically on customer experience in the digital era, many sessions explored topics like contact centers in the cloud, integrating new capabilities while protecting investment, popular outbound and improvements in self-service methods, and automation designs to help personalize and improve the customer experience and deliver an exceptional and efficient experience across all interactions. The sessions at the Experience Theater at the Solutions Expo covered a range of trends such as artificial intelligence, speech, social, and machine learning sparked ideas on how to reinvent an organization’s business models and customer experience. The Desk Phone Designs team would like to thank everyone for stopping by our booth at Avaya Engage. We were very excited about the large number of visitors to our booth. It was a great venue to present our snap on phone covers to Avaya, Avaya Business Partners, IAUG members, and the Vendor community. Everyone who visited our booth enjoyed watching the video presentation of our patented, hydro-graphic, custom surface-decoration technology. Our video production showed the latest and most popular patterns and natural designs, which creates a new color and appearance on the telephone enhancing its value. Visitors to our booth were able to see all our current models including the Avaya 1408, 1416, 1608, 1616, 9504, 9508, 9608G, and 9611G phones and button modules. Along with the Avaya J-100 series which will be available through distribution mid-February 2019. The visitors to our booth were amazed at how the phone covers simply snap on and off with no need for tools to install, and the ability to customize with their logos, graphics, and images. Coming soon, customers can quickly and easily customize using the Desk Phone Designs custom design site and our product designer tool. The Desk Phone Designs team looks forward to helping customers express their individuality, style, their message and their purpose. Phone Expressions by Desk Phone Designs will allow our future customers to personalize their phones to be more reflective of their business brand and personality. During the keynote speech, the former quarterback, and two-time Super Bowl champion Peyton Manning mixed self-deprecating humor with important lessons he’s learned through football about how to develop a winning mindset. Manning referenced customer focus, transparency, diligence, optimism, and agility, and how essential those values are “on and off the field.” He said, we must all be fast, flexible, and fluid no matter what business we were in. Manning talked about the transforming world of work, and how fast things are changing – in football, technology, and every other industry – and how we need to be agile to adapt. He said at some point, we all have to come from behind, and playing smart through diligent preparation can give us the edge on the competition. He says to always look for the little things that can make a difference, and the importance of being fluid and able to adapt to different situations. To be resilient and learn to pivot. He also talked about the need to remain nimble and take on whatever life – or the marketplace – throws at us. He gave us the example of his multiple neck injuries that eventually led to him missing a season. He explained that he had to come back from that injury and adapt to playing with a new physical state. “To win, sometimes you have to abandon old routines,” he said. Part of that preparedness is becoming a “master of inquiry” – “ask the right questions, to the right people, at the right time,” he said. We are supposed to ask questions, and if we don’t know how to solve a problem from every angle, we’re not adequately prepared. 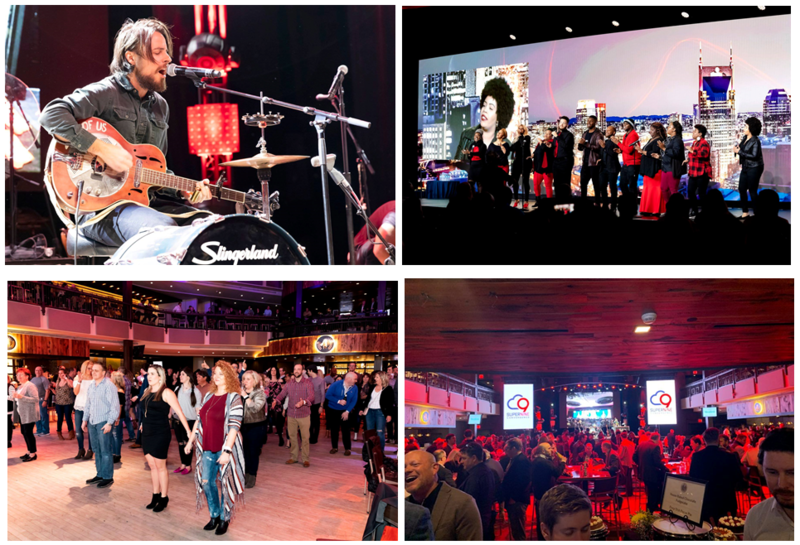 We closed out Avaya Engage 2019 with a rockin’ party at ACL Live! The closing night party allowed us to network with new and old friends while we enjoyed drinks and appetizers at one of Austin’s best venues, Austin City Limits Live at The Moody Theater. ACL Live at The Moody serves as the new home of the KLRU-TV produced PBS program Austin City Limits, the longest running music series in American television history. Set in downtown Austin, ACL Live is the premier destination for live performances. Avaya Engage 2019 was amazing! Now it’s time to start planning for next year, join us all in Phoenix, AZ in 2020. 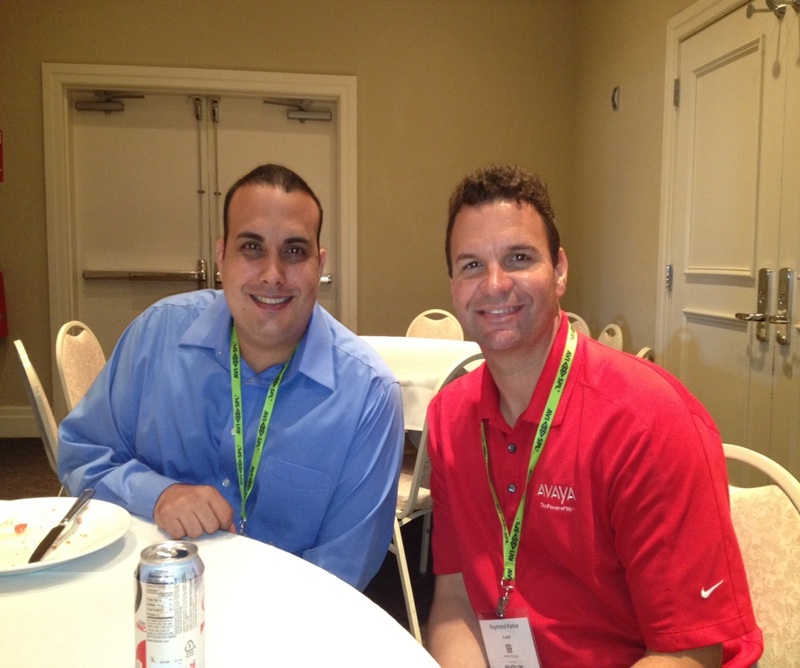 Avatel’s Lead Engineer Jon Damiani, had a great time at the forum with his peers and the Avaya solutions experts. Some of the specifics that were discussed were based around what would be available in the IP Office November release, SSL Certificates from the IP Office, adding security keys and loading to all Avaya devices, an in depth setup and troubleshooting of the Avaya SBC, known issues, break fixes, and Q&A. There were also discussions regarding setup, install, and troubleshooting of Equinox. 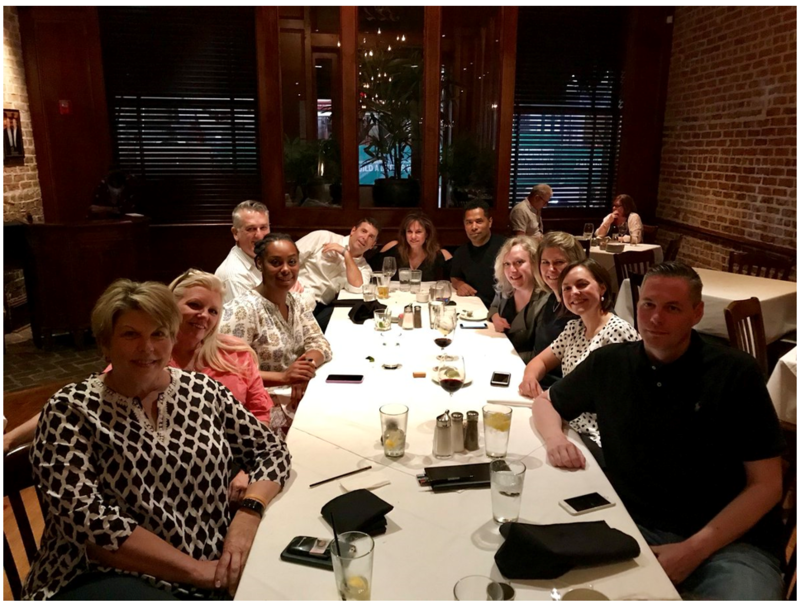 The 2018 ScanSource 1COMM Solutions Summit in Hilton Head, South Carolina, focused on enhancing the customer experience, transforming and growing business, incorporating a recurring revenue service model, and the technology solutions that meet the needs of end users. During the first evening, ScanSource partners were able to network and talk shop around a robust offering of cloud, carrier, and hardware suppliers in the exhibit hall. The engaging exhibit floor provided complete unified communication and collaboration solution discussions around call centers, huddle spaces, mobile workplaces, and classrooms. 1COMM was truly all about enhancing the ever-changing customer experience. Of course the event also featured great food and informative breakout sessions. 1COMM attendees were able to meet with ScanSource top industry suppliers, including our very own Desk Phone Designs at the evening expo. Staying with the overriding theme of the event “The Customer Experience”, Desk Phone Designs believes to create a better customer experience you also have to provide choices. For many years, customers have made requests for different desk phones colors, other than what was normally available in the industry like black or grey. Customers say they want the phone to be more reflective of their business brand and personality. Desk Phone Designs listened to the customers’ requests, and is now offering injection-molded, hydro-graphic custom surface decoration technology that allows the customer to express their individuality, style, message and purpose. 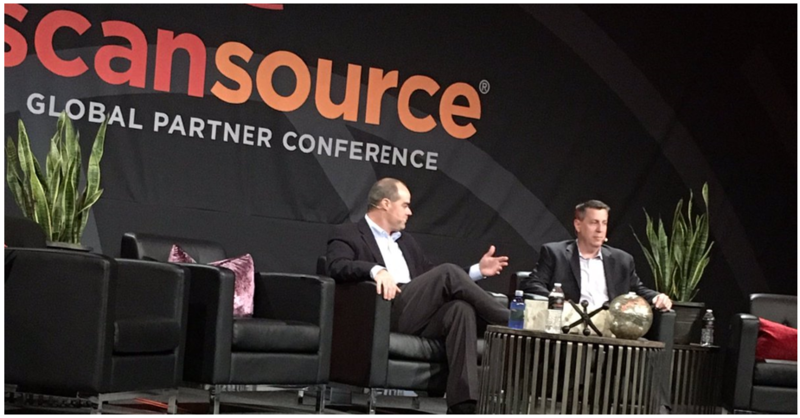 Shedding new light on the impact of the digital transformation, the following day featured ScanSource leadership, executives, and subject matter experts paving the way for what’s to come from ScanSource. Thursday’s educational sessions were designed to build upon each preceding session and offered something unique from other typical breakout formats. Buck Baker, ScanSource co-president, addresses attendees and recognizes vendor partners and event sponsors. The 1COMM audience heard multiple times how ScanSource is listening more than ever to the end user in order to help its resellers grow their business. While this might sound reversed from ScanSource’s approach in the past, it was made with careful consideration around learning the needs of the end user and providing the reseller with critical hardware and software offerings that augment their portfolio. 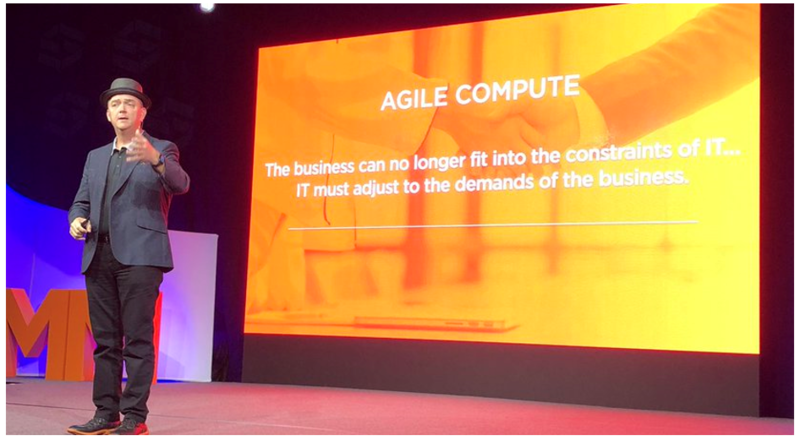 Intelisys SVP of Cloud Transformation, Andrew Pryfogle, gave a deep and engaging dive into the customer experience. Knowing end users want personalized, connected and faster user experiences, he discussed innovative customer service practices that incorporate much of the technology resellers must implement in order to meet growing demands. 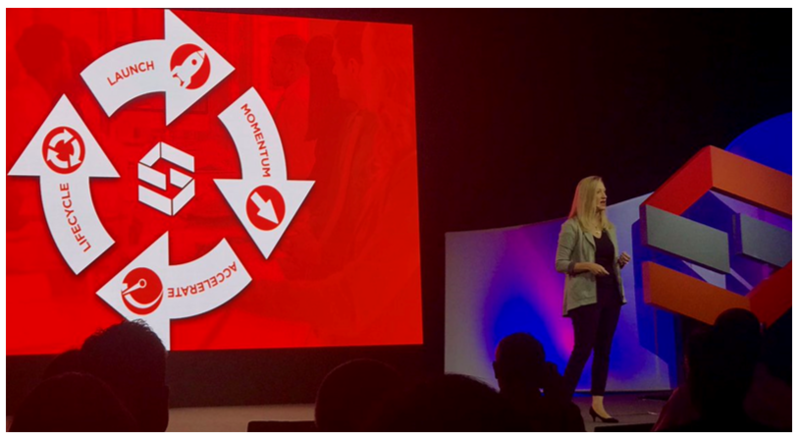 VP Ansley Hoke discussed transforming the Scansource programs to be both specialized and focused with their complete FastPath offering, combining launching, lifecycle, momentum, and accelerating services to move your business forward. To wrap up the morning, John Foley, retired Blue Angels navy pilot, delivered an inspiring keynote address. He used rare and exciting video footage and high voltage music in his highly engaging keynote speech. John shared a high performance model of behavior with us that we all could easily adopt. Foley explains that it all starts with the “Glad to Be Here” mind‐set, which underpins his high performance framework. He says it starts with a level of high belief which is necessary for high achievement, and with this comes clarity of vision. The “Glad to Be Here” mind-set suggests a strong correlation between gratitude and high performance. An attitude of gratitude isn’t simply a thought, it’s an action and a mindset. Owning an attitude of gratitude while working toward a greater purpose is the “Glad to be Here” mindset shared by all members of the Blue Angels. Foley adapted “Glad to be Here” for business, establishing a Diamond Performance Framework or DPF for short, where any teams – including ours — can support a high-performance culture, sustain excellence and continuously improve. 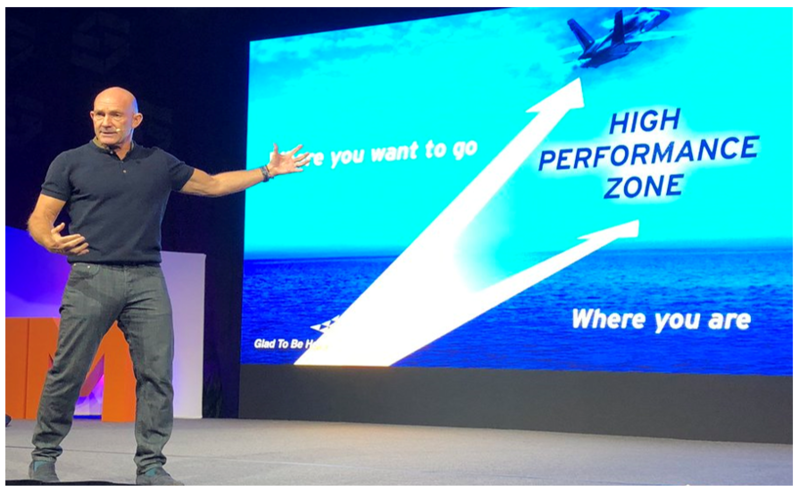 Foley pointed to what he calls the “high-performance zone,” the gap between where you are and where you want to go. The Solutions Summit not only included an expo and informational sessions, but also a beautiful location for an afternoon lunch by the sea. 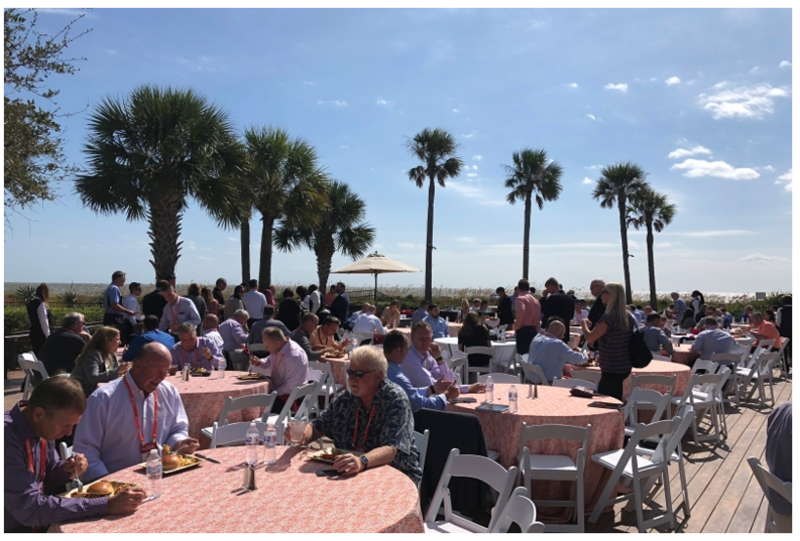 After an alfresco lunch by the ocean, the afternoon educational sessions focused on how to transform your business and the financial payoff, with Intelisys VP of Finance, Mike Ketchum and Tim Ramsey, ScanSource VP of Financial Operations and Analysis, presenting. As an extension of that conversation, Pryfogle took it one step further by explaining how to transition into a monthly recurring revenue model. Attendees were thrilled to see the wide array of impressive cloud and carriers that comprise the ScanSource Intelisys line card. Providing real insight from ScanSource customers and industry peers, John Gaillard offered humorous stories of past 1COMM events as well as an introspective look at how three unique businesses approach their managed services practices. Finally, ScanSource CTO Greg Dixon closed the afternoon talking about the future of IoT, Blockchain and AI technology, highlighting the immense growth opportunities for these areas while entertaining the crowd with his informative forecasting. 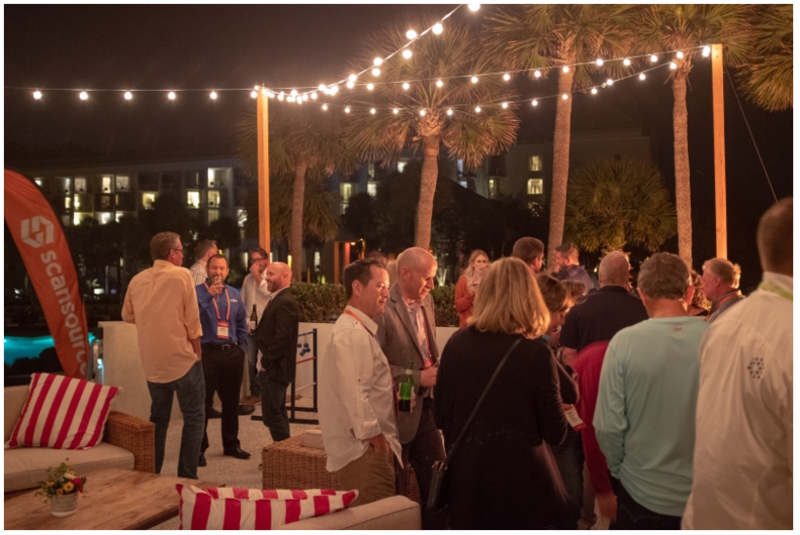 Pictured above, a networking dinner reception featuring live music, Southern cuisine and a relaxing evening of socializing for partners at the Scansource 1COMM Solution Summit Closing Ceremony. From our opinion, there is no doubt that the Scansource 1COMM Solution Summits is the go-to event for technology-focused resellers to learn valuable insight on how to best grow their business. 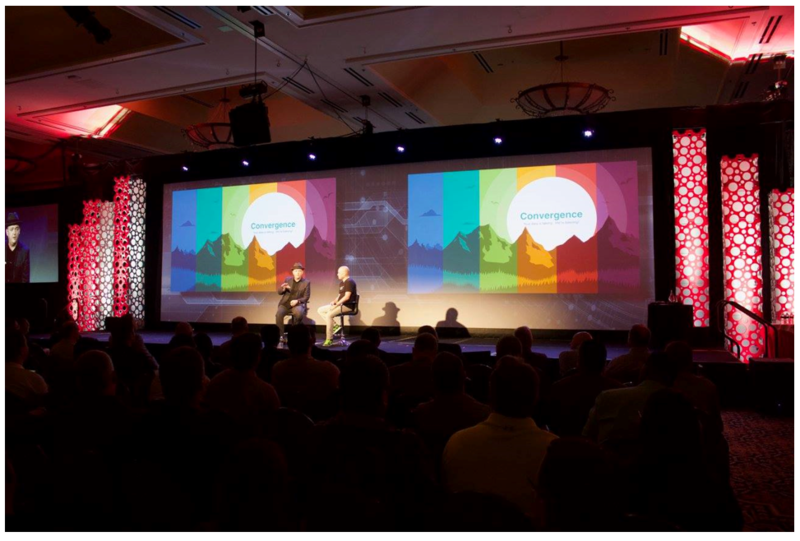 The Super9 Convergence multi-day conference was designed to bring the Intelisys and ScanSource Partner communities together, converging around the central theme of accelerating the growth of Sales Partners’ cloud business. Intelisys, a ScanSource company, is the nation’s leading Technology Services Distributor of business communications services, including voice, data, access, cable, collaboration, wireless and cloud. Intelisys is dedicated to one thing – serving the needs and accelerating the success of the industry’s top producing telecom sales agents, IT Solution Providers, VARs, MSPs and integrators, as they leverage the power of recurring revenue in their businesses. 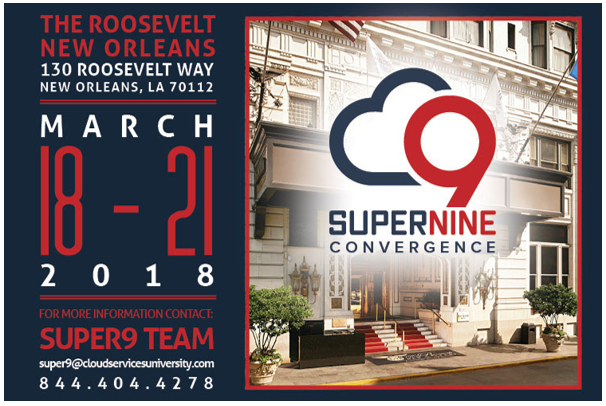 The Super9 Convergence was the first industry-wide channel sales event purpose-built to grow cloud & carrier sales. Avatel’s Operations VP, Torina Boatright attended the three-day education conference with other Super9 alum to accelerate our MRR business. 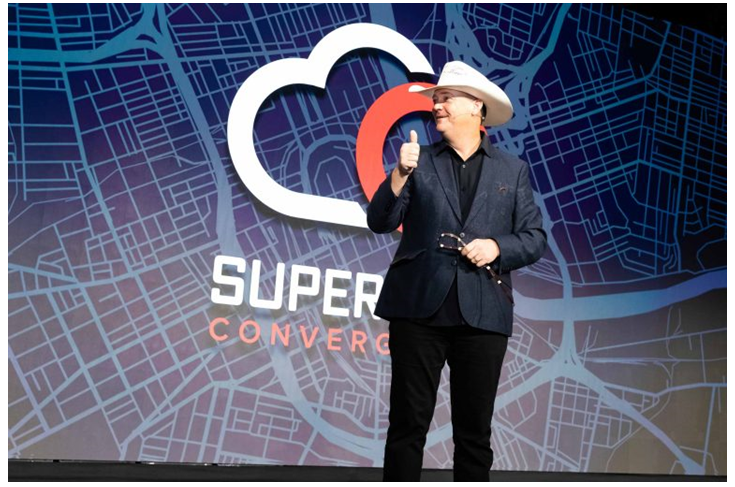 Based on the exclusive Super9 sales methodology, Super Convergence was the only event solely dedicated to teaching real, actionable sales methodologies and skills to channel sales professionals committed to growing their cloud and carrier services businesses. Intelisys Sales Partners, agents, VARs, and the world’s leading cloud and carrier services providers gathered to deep dive into the ever-changing channel sales ecosystem and walk away with new skills, techniques, tools and connections aimed to dramatically accelerate the growth of their MRR businesses. The Super9 Convergence group shut down Bourbon Street for a parade with all of the fantastic partners marching together like a mini Mardi Gras! Avatel left New Orleans ready to level up and armed with the resources, skills and relationships to make it happen. We learned from our peers and the smartest minds in the channel. We stepped away from theory and embraced reality – real data, real participation, and unparalleled results. The Extreme NOW World Tour is a multi-city, global roadshow designed to share Extreme’s company vision and strategic roadmap, gather feedback and answer questions on their portfolio enhancements. During the recent Extreme NOW event in Tampa, FL, our Avatel Engineer Jon Damiani was able to hear from Extreme executives and product strategy leaders discussing the roadmap for upcoming technology like Extreme’s fabric technology. They also discussed the push for Software Driven Networking using virtual machines and containers to allow for truly separate and secure networking. They spoke about the most recent business acquisitions (Avaya Networking, Zebra WLAN, and Brocade Data Center) bring to the new Extreme Networks and the partner community. Extreme Networks is in a period of extraordinary growth, having acquired assets from three companies all within just over a year. The recent acquisitions have positioned Extreme Networks as a networking force to be reckoned with! The new Extreme is now the #1 alternative to HP and Cisco – offering true end-to-end enterprise networking along with its legendary industry-leading service and support. 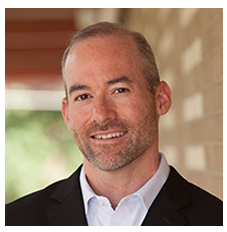 Ed Meyercord serves Extreme’s President and Chief Executive Officer as well as keeper of the vision. He joined Extreme’s Board of Directors as an independent director in October 2009 and has served as Chairman since March 2011. Prior to assuming an operating role at Extreme, Mr. Meyercord was Chief Executive Officer and Director at Critical Alert Systems, LLC—a software-driven, healthcare information technology company—that he co-founded in July of 2010. Previously, Mr. Meyercord served as CEO, President and Director of both Cavalier Telephone & TV, a privately held voice, video and data services company with an extensive fiber network; and Talk America, Inc., a publicly traded company that provided phone and internet services to consumers and small businesses throughout the US. Paul Unbehagen is Extreme’s Senior Director of Product Management and an active member of the IEEE and IETF. Paul has 18 years of deployment, operational, network design and architectural experience in live networks, ranging from Government, Enterprise and Carrier environments. He has worked on the design, standardization, implementation, deployment, and support of many modern routing protocols (e.g., MPLS, BGP, OSPF, IS-IS, and SPB). Paul is also a co-author of IEEE 802.1aq/Shortest Path Bridging and currently has approximately 24 networking related patents. He has also participated in several IETF WGs to include IS-IS, BGP, L2VPN, and IPVPNs and is currently the editor of the LLDP auto attach IETF draft. The recent ranking in the Gartner Critical Capabilities report is a testament to their strong multivendor product portfolio and their dedication to providing award-winning solutions and customer service. Extreme Networks was also recently acknowledged as a Visionary in Gartner’s Magic Quadrant for Wired and Wireless LAN Access Infrastructure2, which reiterates their commitment to offering top-quality products and solutions to meet growing connectivity requirements. Avatel along with other partners were invited to Extreme Connect 2018. This conference serves as the last stop on the World Tour and will be a robust technical user conference focused on customer education and peer-to-peer networking. Mark your calendar now and plan on joining us April 17 – 20, 2018 in Scottsdale, Arizona, for the first ever Extreme User Group Conference – Extreme Connect. 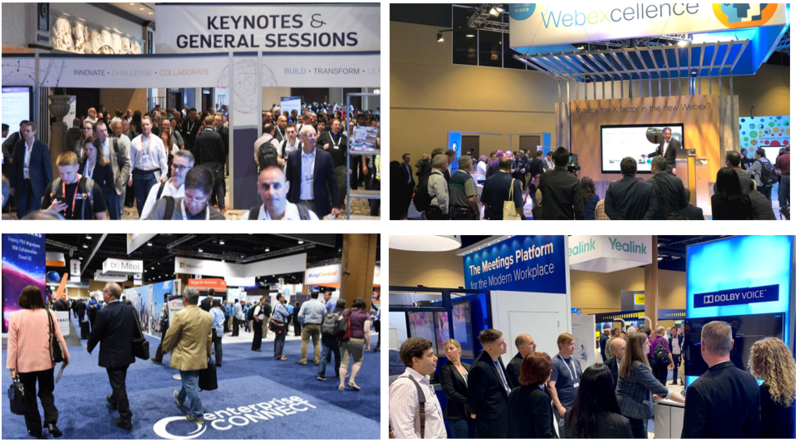 Immerse yourself in three jam – packed days of general sessions and technical breakouts on hot networking topics such as Analytics, Campus Core and Edge, Cloud, Design and Configuration, Data Center, Fabric, Management, Wireless and more. Get access to in-depth education and technical breakouts across the entire Extreme portfolio from the access layer through the data center. Numerous product and industry experts will be on-site leading sessions covering Extreme as well as hot networking topics such as Analytics, Campus Core & Edge, Cloud, Design & Configuration, Data Center, Fabric, Management, Wireless and more. There will be plenty of time for peer-to-peer networking, including Birds-of-a-Feather sessions, so that you can share your best practices and learn from your peers. And let’s not forget the connections you’ll make off the agenda at our fun after-hours events! Grow with your network and expand your skills with technical training on-site. Choose from four in-depth courses, all designed to advance your knowledge and help you successfully manage Extreme products and software. Fly in two days early to get certified and get even more out of your time at Extreme Connect! Last week’s ScanSource Global Partner Conference has now come to a close, and I can’t help but think about all of the exciting times we had for three full days in beautiful Greenville, S.C., from November 7-9. 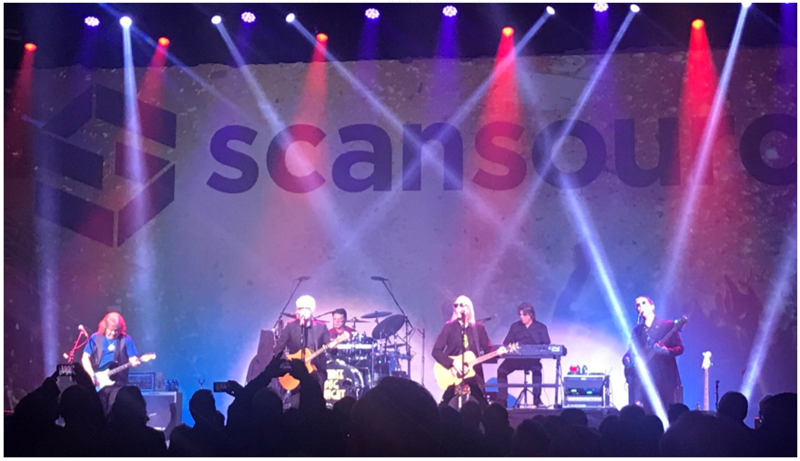 From incredible evening entertainment, informative keynote sessions, to a newly unveiled plan for ScanSource in 2018, the ScanSource Global Partner Conference was a major success that included more than 1,400 attendees from 26 different countries. The networking expo provided the perfect opportunity for partners like Avatel to network with the ScanSource team and other Manufactures. The evening expo at the Greenville Hyatt featured 113 different manufacturing suppliers from most of ScanSource’s deep line card. This high-energy networking opportunity gave attendees a hands-on chance to interact and see many of the total solutions ScanSource offers, while mingling with approximately 316 representatives from the ScanSource extended family. With its 25th anniversary just weeks away, the distributor’s big message was adopting new capabilities and transitioning to keep up with the latest technologies and market demands. Mike Baur, ScanSource CEO spoke to a packed house about the evolution of the company he founded with five others in 1992. He welcomed everyone and wasted no time getting down to “new” business at the company’s Global Partner Conference Wednesday morning. In the opening presentation, we learned that ScanSource continues to transform to help its partners keep up with the latest technologies and market demands. We also learned that ScanSource has sunk significant investments into market research and end-user surveys over the past two years, CEO Mike Baur told solution providers gathered at the ScanSource Global Partner Conference, “We want to help partners expand the range of products and services they sell into their existing customer base. We are ready to help them in their transformations to cloud and connectivity, managed services, SaaS and other capabilities increasingly in demand, and that customer experience is a top priority for everyone”. Knowing that end users are moving toward recurring revenue models and everything-as-a-service, Baur said, “We’re embracing new market opportunities that reflect what your customers want most.” He then invited executive leaders from recent acquisitions — Intelisys, POS Portal, Network1, and CDC Brazil — to share how they became part of the ScanSource family. Baur leads a panel discussion with executives of four companies that ScanSource has acquired: CDC Brasil, Intelisys, Network1 and POS Portal. “However you position yourself, we can help you get there. We’ve got to rebuild what we do, we’ve got to rebuild what we’re known for together, and we want to help you do that,” said Mike Baur, ScanSource’s CEO. To conclude, Baur asked the audience, “Are you ready to grow?” Without hesitation, it was apparent this new paradigm shift is welcome among ScanSource partners, including Avatel. The ScanSource acquisition of master agent Intelisys, provides a way for Avatel to add new telecom cloud services to our current portfolio. Making this transition and adding a recurring revenue stream is something we’ve wanted to do for many years. This allows Avatel to sell services alongside the products we provide. The bridge between both channels significantly broadens the capabilities and opportunities for Avatel. ScanSource is working to help hardware-focused partners like Avatel build a recurring revenue stream by getting us plugged in with various training programs, like Super9. We really appreciate Susan Wilson and the ScanSource/ Intelisys team allowing Avatel to receive the best of the best in cloud training. The Super9 Cloud Training consisted of three-days of intensive cloud compute technical and sales methodology training that incorporated live sessions with ongoing peer group support. We can’t thank you enough Susan for introducing Avatel to the Intelisys Solutions Team. The Avatel Team had a great time at the event. 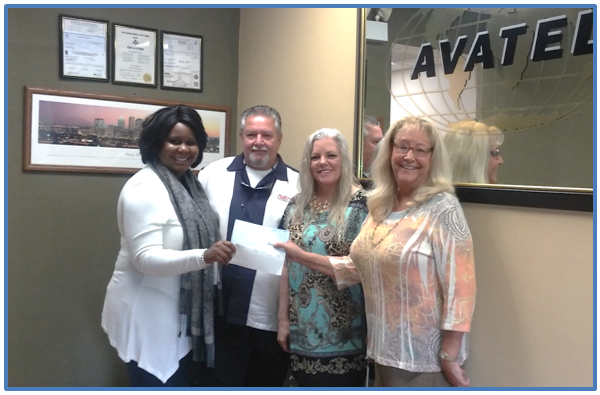 Pictured below, Jamie Wood – Avatel EVP, our fabulous ScanSource/Catalyst Telecom Business Development Manager – Susan Wilson, Torina Boatright – Avatel Operations VP, and Ernie Darias – Avatel’s President. To finish out the morning, keynote speaker Phil Hansen showcased his incredible artistic talent by way of learning to overcome a shaky hand that almost destroyed his will to create. Translating perfectly to a corporate setting, Hansen’s “embrace the shake,” message reminded us all that limitations are only obstacles. Asking, “What happens when resources become scarce,” he challenged the crowd to think and do more with less in an often resource-strapped, office environment. Although the weather was unseasonably cold and gloomy, the evening party at the Old Cigar Warehouse later that night offered a Tour of the World, that highlighted the various “flavors and vibes” of ScanSource’s different offices around the world, such as a mariachi band performing in an area representing Mexico. Feeling like a miniature Epcot, it was easy to travel the world in just a few steps. Guests could walk to “Mexico” and enjoy a mariachi band, churros, and salsa dancing; and with a quick turn, venture to “California,” with stone-fired pizzas, s’mores, and comfortable seating in a warm ambience. GPC attendees began Thursday morning at the TD center, ready for a day of mind sharing. A packed agenda offered a full day of information and expertise from ScanSource leadership across the traditional business units. The morning agenda featured executives speaking as well as mini-educational sessions from their best-of-breed suppliers. David Hertwig, President of ScanSource Catalyst talking to Gary Levy, Channel VP from Avaya on the digital transformation trends helping partners make money today. To close out the GPC, the final party of the night was another taste of the South and featured live performances by Southern rock greats, The Marshall Tucker Band and Three Dog Night. While enjoying the concert, guests were again treated to food from around the globe and décor that encompassed everything from the Greenville Liberty Bridge to a Ferris wheel reminiscent of the London Eye. This year’s Avaya Fall Technical Forum was held at the Eaglewood Resort and Spa, just outside of Chicago, IL. 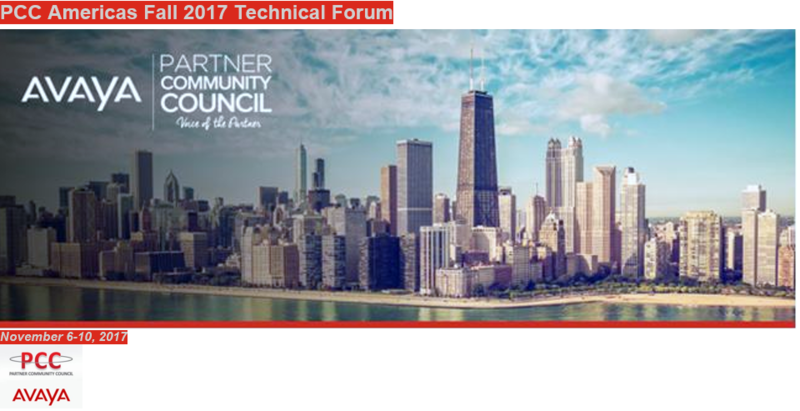 The Partner Community Council (PCC) forum combined with the Avaya TechMaster’s forum allowed Partner’s like Avatel to identify areas of common interests and concerns for the purpose of improving products/services and Avaya/Partner processes. During the conference, Avaya covered a range of topics; including IP Office R11, supporting products and platforms, and Avaya hosted technologies. Our Avatel Lead Engineer (Jon Damiani) and our Sales Director (Salena Miller) were excited to work directly with Avaya at this year’s forum to ensure that new Avaya product rollouts contain all the necessary elements for successful introduction, implementation and maintenance. Jon and Salena believe that the expected results from the activities during the forum will provide Avatel and the Avaya Partner community with enhanced product performance, operational effectiveness, and technical support to raise customer satisfaction. This was a great opportunity for our Avatel team to gain product and service improvement knowledge, address strategic movement in the marketplace, operational and logistical issues and gain key technical information. 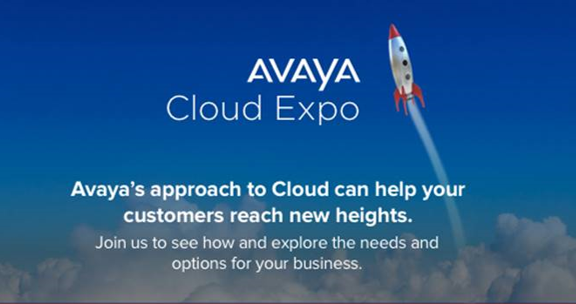 Avatel’s Engineering Team attended the Avaya Cloud Expo in Tampa, FL on May 23rd to learn about Avaya’s broad range of cloud services that can help our customers reach new heights. By attending the event, our Engineers explored Avaya’s approach to cloud – Cloud Your Way. They were able to connect with Avaya experts to discuss the available cloud models and deployment options that best meet the needs of Avatel’s customers. Bruce and the Avatel Engineering team also learned that Valcom Paging has stepped it up to be a critical point of Paging and Alerting systems with Cloud solutions. With their New PagePro IP system. This allows either a full IP paging solution for customers with a cloud solution or a hybrid to reuse analog equipment while migrating to the cloud. Bruce and his other Engineers all agreed that the Top Golf activity was great! 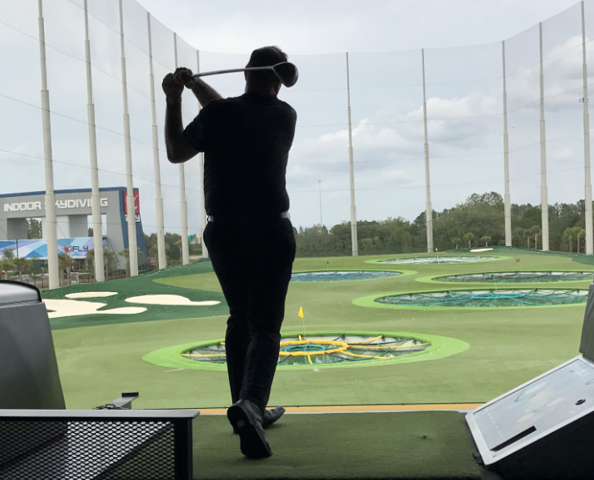 Being able to sit back with their Avaya contacts and hit a few balls. Bruce believes these types of events that build a stronger relationship between Avaya and the Partner are crucial. For more than 26 years, Enterprise Connect has been the leading conference and exhibition for enterprise IP Telephony, Converged Networks and Unified Communications in North America. Enterprise Connect brings corporate IT decision makers together with the industry’s vendors, analysts and consultants to focus on the issues central to enterprise networks and communications. Join other business and technology executives on March 27th – March 30th who are tasked with migrating their enterprise communications and collaboration systems to the next level and looking to expand their business reach through a variety of technologies. Technologies for enterprise communications and collaboration are undergoing massive and rapid change with new products, services, architectures and players. Enterprise Connect creates a unique opportunity for you to hear informed debate and thorough analysis of the trade-offs associated with each approach. From the keynote lineup to our breakout sessions, you’ll hear from independent, vendor-neutral experts as well as pioneering enterprise executives. You will also be able to compare the perspectives offered by the leaders of all the major equipment, software and service providers. The conference program offers dozens of sessions, new this year, featuring leading experts, analysts, and technical specialists who answer your questions about technological capabilities, system features/functions, business/economic models, and life-cycle costs. Enterprise Connect is the ONLY place where the major system and software vendors and their products are available in one location. You get direct access to the designers and developers of systems for Unified Communications, contact centers, mobility, video, SIP Trunking, team collaboration/messaging, and management. Enterprise Connect features senior IT/telecom executives from a wide range of enterprises who will describe their migration strategies, decision criteria and the lessons learned from installing state-of-the-art communications and collaboration systems and applications. Enterprise Connect doesn’t advocate one solution over another. Instead, hear how products have worked in real-life deployments, and the realistic prospects for technology evolution. Don’t miss this event, the only conference totally focused on the needs of key decision makers in enterprise communications and collaboration. It’s the premier event for meeting with your peers and learning what your competitors are up to. 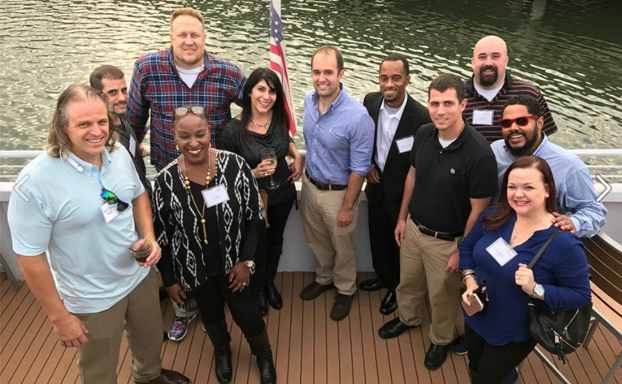 The Avatel Team Jumped into FY17 with a new vision of communications and a new way to experience it, as they joined Avaya’s sales leaders on January 11, 2017 on the Yacht StarShip for the Avaya Partner Experience Day! We didn’t want to miss this opportunity to network with our colleagues and connect with Avaya experts! Leveraging Avaya’s portfolio, we empower our team members to engage with action-oriented sales leadership, and drive the customer’s objectives and business outcomes through their experiences with Avaya’s technology and innovation. Communications enable engagement. Engagement is an experience. A great experience leads to happy and satisfied customers. Experience is everything. As we improve our customer’s experiences, we improve results. Hope comes to life when a homeless child realizes their future can be different. Avatel was please to sponsor the annual Bridge Builders event as an Uplift Partner, celebrating testimonies of the lives transformed through compassion. Metropolitan Ministries provides critical services to people in need all across the Tampa Bay community. The annual Bridge Builders event is Metropolitan Ministries’ largest and most critical fundraiser of the year. Avatel partners with Metropolitan Ministries all year long to alleviate suffering, promote human dignity and instill self-sufficiency. Network and infrastructure technology leaders, architects, engineers, and managers who desire to learn about and experience cutting-edge Avaya networking technologies and innovations and engage with eminent industry engineers and architects on the latest developments in Fabrics, SDN, Big Data and beyond. Mobility and Unified Communications & Collaboration technology leaders, architects, engineers, and managers who desire to understand how to leverage their Avaya technology to address BYOD; leverage existing video conferencing facilities; integrate with Microsoft applications; and plan upgrades and migrations to the current releases of the Avaya Aura Platform, Aura Messaging, and Aura Conferencing, including their move to a virtualized infrastructure. Customer Engagement and Contact Center leaders, architects, and managers who desire to leverage core contact center infrastructure and automation to enable Omni-channel customer experience; gain in-depth knowledge of performance, analytics, and workforce management solutions to improve contact center efficiency; and learn design practices for proactive communications to grow revenue. Business Partner technical and solution leaders, architects, engineers, and managers who desire to gain an in-depth understanding of Avaya’s portfolio to support the implementation and delivery of solutions through their customer engagements. Industry Consultants who desire to gain a technical understanding of Avaya’s networking, contact center, and unified communications and collaboration portfolios to support their client engagements. Join us at the Avaya Technology Forum (ATF) 2016 for an interactive learning experience that focuses on helping you make the most informed decisions possible on solutions that will drive business outcome. During ATF you will gain insights about migrating, designing and implementing the right customer engagement, unified communications and collaboration, networking, services, and architecture for your enterprise. Make plans to attend ATF and experience what others call ‘the best learning and networking environment available in high tech today. 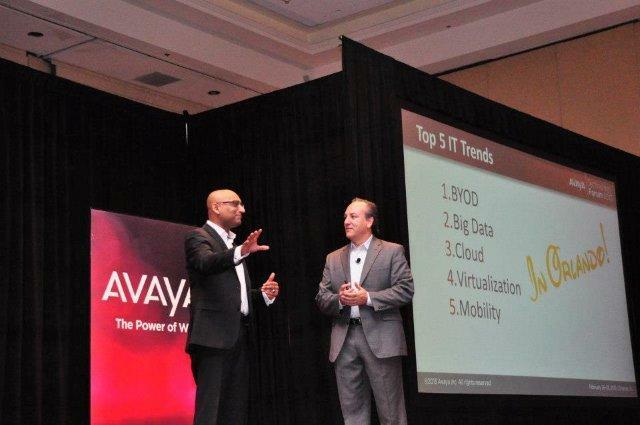 Avaya Technology Forum (ATF) 2015, currently in its fourth consecutive year, provides a unique learning environment that strips away the hype and dives into the real challenges facing today’s IT leaders by providing expert workshops, live demonstrations and solid recommendations for enterprise technology planning. Through in-depth technical sessions, ATF is focused on one over-riding goal: to help you make the most informed decisions possible about migrating, designing and implementing the right customer engagement, unified communications and engagement, networking, services, and architecture for your enterprise. Discover comprehensive roadmaps for the latest products, technologies and applications that are – or soon will be – in the market. Participate in both technically rich and forward planning sessions that comprise the foundation for enterprise communications and fabric-based networks. Experience newer options and trends that are shaping your decisions-including cloud-based services, software defined networks, virtualization, and the increasing demands for security, management and resiliency. Get a strong start in 2014 by significantly increasing your knowledge and ability to build better networking solutions for your organization! 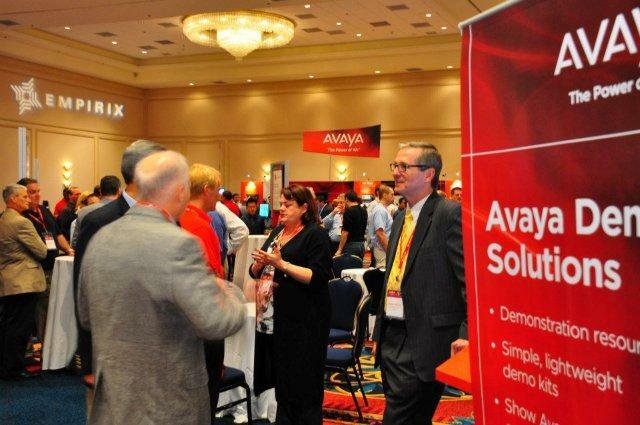 Top 5 Reasons to Attend Avaya Technology Forum 2014! 1. Learn about networking technology in an environment that strips away the hype and dives into the real issues and challenges with live demonstrations and solid recommendations for network infrastructure. 2. Connect with Avaya product teams and solution architects driving industry standards and solutions, and provide direct feedback for future features and capabilities. 3. Collaborate and network with industry experts and your peers through interactive discussions focused on real-life network designs and challenges. 4. Discover the Avaya Networking roadmap, presented directly by our top experts and executives that will shape the future of networks so you can effectively plan a three-year strategy. 5. Renew your certification by participating in the Avaya Professional Design Specialist (APDS) certification fast track program. During this 3 day technical engineering forum, you will experience the power of Avaya Networking architecture and how it enables “Business Innovation in Real Time” with next generation collaboration solutions in Unified Communications, Video, and Contact Centers. Take this opportunity to meet and hear what subject matter experts have to say, talk to the people driving new standards and receive best practice design recommendations. Enterprise Connect is the premiere enterprise conference that helps attendees plan their migration to next-gen communications and collaboration. The conference program covers the full range of platforms, services and applications that comprise modern communications and collaboration systems. Attendees will hear case studies from senior enterprise executives, as well as from the leaders of major industry players like Avaya. We are not provided with any complimentary full conference passes. However we will be able to offer FREE exhibit hall passes, which will allow access to the exhibits, evening receptions (in the exhibit hall), and admission to keynotes. You will need the minimum of an exhibit hall pass to access the showcase. In accordance with travel guidelines, Avaya Sales associates should review the conference registration list and determine with your management if travel to accommodate customers is appropriate. Step 2: Select the registration package you prefer using the Avaya VIP discount code: CMAVAYA. The Avaya discount price and VIP code will not expire if you register before March 18. We recommend that you determine which sessions you would like to attend so you can select the right registration package for your needs. 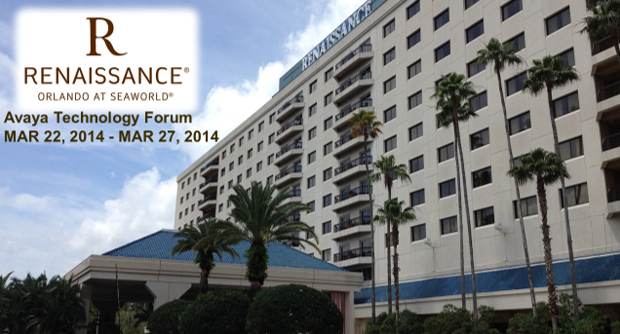 To review the agenda, go to http://www.enterpriseconnect.com/orlando/conference/overview.php. Step 3: For approved Avaya Sales associates that require hotel accommodations, go to the Enterprise Connect conference housing site. Please note that you should be registered for the conference first before booking housing to ensure you receive the Enterprise Connect discount. http://www.enterpriseconnect.com/orlando/registration/hotel.php. 1. Invite your customers and prospects to Enterprise Connect. 2. Click here for the customer invitation. (PDF / OFT) Links for registrations activate once the invitation has been sent. Invite your customers to join you at the Avaya Innovation Hospitality Lounge and Lab on Tuesday, March 19 for a two hour block anytime between 9:00 am – 9:00 pm and Wednesday, March 20 between 9:00 am – 1:00 pm where food, refreshments and innovative demos will be featured. To send an invitation to your customer by using the Innovation Hospitality Lounge and Lab invite, click here. (PDF / OFT) Alternatively any Avaya Associates or Authorized Partners can book times with attending customers by clicking here. Schedule customer booth tours:Click here. To access updates for the information listed above, visit the Avaya Sales Portal at https://avaya.my.salesforce.com/apex/sp_EventDetail?c=a3da0000000LJ8oAAG&Id=a3j30000000KzgQAAS. 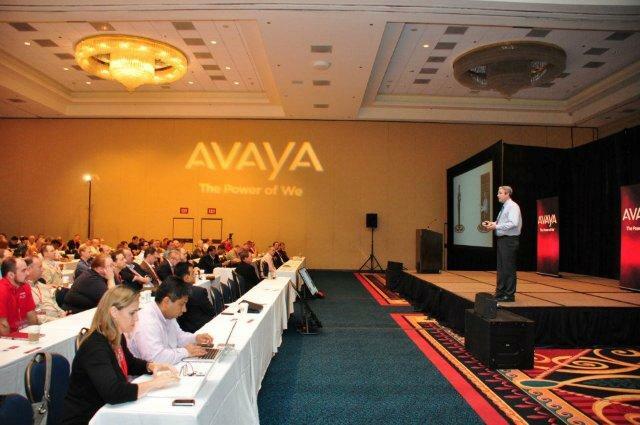 The Avaya Technology Forum 2013 was held from Feb 25-28, where over 400 attendees descended upon Orlando to get the latest on Avaya technology from Avaya subject matter experts. Hosted and driven by the Avaya Networking business unit, this unique technical engineering forum provided customers, prospects and partners an opportunity to see Avaya technology, solutions, business applications and real world network deployment challenges in a workshop format with detailed technical presentations, deployment methods, observations and demonstrations. During the 3 day technical engineering forum, we experienced the power of Avaya Networking architecture and how it enables “Business Innovation in Real Time” with next generation collaboration solutions in Unified Communications, Video, and Contact Centers. Following the keynotes on the first day, attendees participated in more than 30 unique breakout sessions led by subject matter experts with live demonstrations at the Demo Center set up at the event. Our customers were able to experience firsthand the power of Avaya’s Networking Architecture and how it enables “Business Innovation in Real Time” for next generation collaboration solutions in Unified Communications, Video, and Contact Centers. Everyone at the event got a strong start in 2013 by significantly increasing their knowledge and ability to build better networking solutions for their organizations! Live demonstrations of the latest and greatest Avaya technologies in breakout sessions as well as in the exhibition hall. Learned how to build the next generation cloud-grade network across the Enterprise without having to sacrifice control for simplicity. Great discussions with the Avaya product teams and solution architects driving industry standards and solutions. There was NO marketing fluff! The Avaya Technology Forum striped away the hype and dove into the real technology issues and challenges with live demonstrations and solid recommendations for network infrastructure. Attendees were able to participate in the Avaya Professional Design Specialist (APDS) certification fast track program to renew certifications. 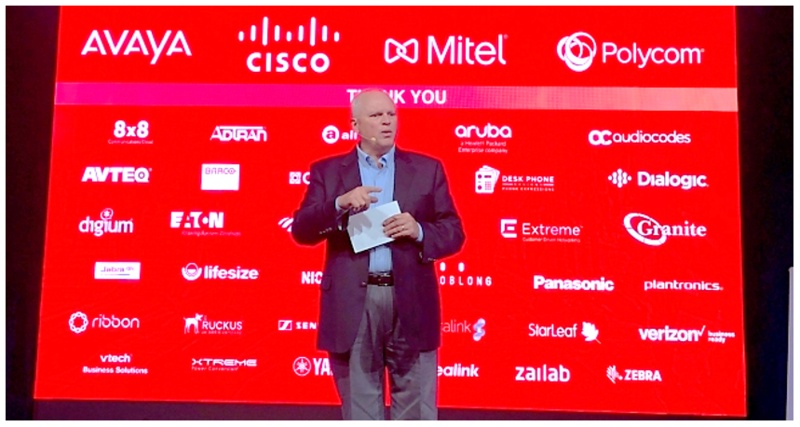 The event certainly made Avaya’s strategic direction and commitment in collaboration and network virtualization and how this is being adopted on the current and future product portfolio clear. The energy from this event was tremendous and is resonating with Avatel and our customers. 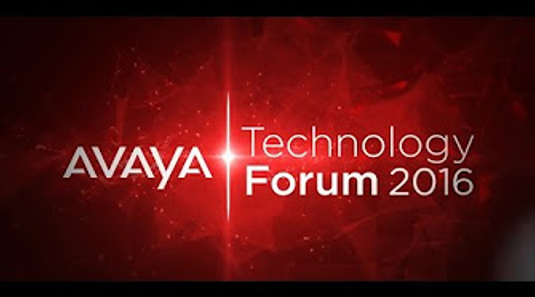 Avatel was grateful to Avaya for providing the Technology forum and we look forward to next year. AVI-SPL brought the innovators and pioneers in video communication together in one expo to help our customers better utilize their communications investment with the latest and greatest technologies available today. Avatel attended the event with our partner Radvision on Thursday, October 18, 2012 at the A La Carte Event Pavilion in Tampa, FL. To learn more, contact an Avatel Video Specialist at 813-347-4608. Description: The face of communications is evolving rapidly, and businesses need to keep up with these trends in order to maintain a competitive edge. Companies struggle do more with fewer resources, and macroeconomics is taking a toll on budgets. The good news is that unified communications and collaboration technologies enable your employees to be more productive, make faster decisions, travel less and improve the bottom line. In this session we’ll explore some of the industry trends impacting the way we work and discuss how Avaya’s Scopia solution can help your employees work smarter. Our video collaboration solutions are designed to meet your unique business needs, allowing you to collaborate anywhere, anytime and on any device. 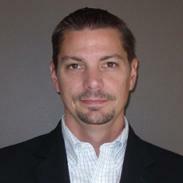 Randy Weeter is director of channels, North America for Radvision, an Avaya Company. 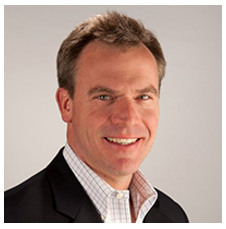 Weeter joined Radvision in 2011 to build and execute upon the North American GTM strategy, including enhancing its channel program as well as recruiting and onboarding new Radvision partners. As part of Avaya, Weeter plays a key role in the company’s video channel program. Weeter previously worked at Cisco/Tandberg, where he was responsible for developing the GTM and sales strategy of Cisco’s first cloud video service offering. An industry veteran for more than 20 years, Weeter has a diverse technology background having served in both leadership as well as individual contributor roles across call center, voice and video collaboration markets. 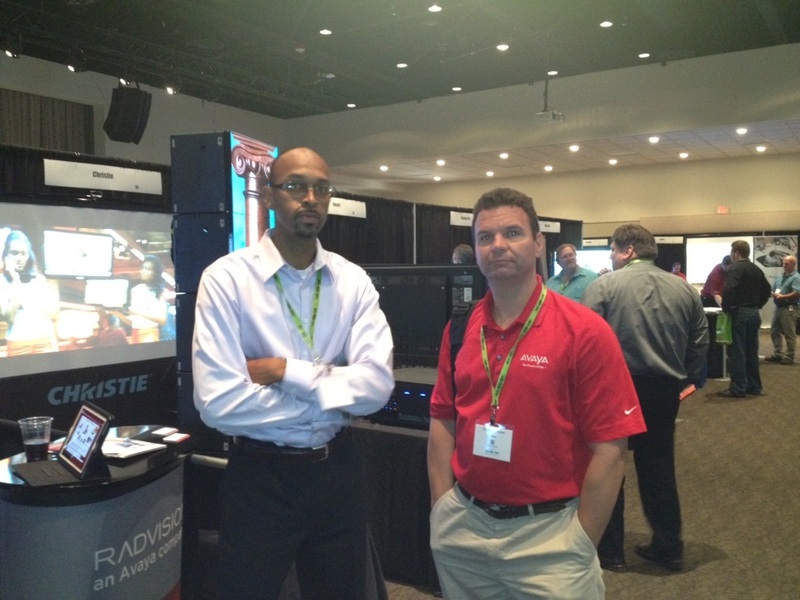 On Friday June 22, 2012, Avatel Technologies showcased the latest products from Avaya at the TBTF coolTECH event held at the Tampa Convention Center. CoolTECH is the premier showcase of new technologies and cutting-edge innovations in the region. Colin Jeffs and Raymond Kerker from Avatel, with the assistance of Omega Dane Kreidler and Daniel Holden from Avaya, demonstrated the Avaya Flare Experience and the AvayaLiveTM Engage immersive Web collaboration tool. Colin and Raymond were surprised with how interested the visitors to their booth were with these two great products. They were asking lots of questions and spending lots of time inquiring about them. “The timing of the coolTECH could not have been better”, said Colin, as there was a live event in Boston for TED (Technology, Entertainment, Design)http://www.ted.com/pages/about which is an organization about new ideas and technologies and they were using the AvayaLiveTM Engage virtual environment to broadcast the event via the internet which is a great example of how this product can work. Imagine the possibilities. Your favorite communications tools—video, e-mail, IM, social networks, phone—at your fingertips. Now put all these tools into a single, unified enterprise workspace and you have the Avaya Flare Experience. Designed to change the way you communicate and collaborate, the Avaya Flare Experience delivers a seamless communications experience that is easy to use, convenient, and ready in real time to help you focus on the task at hand. The Avaya Flare Experience streamlines your applications into unique personal workflows, avoiding the frustration of barriers between technologies. When the Avaya Flare Experience helps manage your communications—you can spend more time managing your business. AvayaLive™ Engage is an immersive Web collaboration tool that provides your organization with innovative new ways to meet, sell and learn. 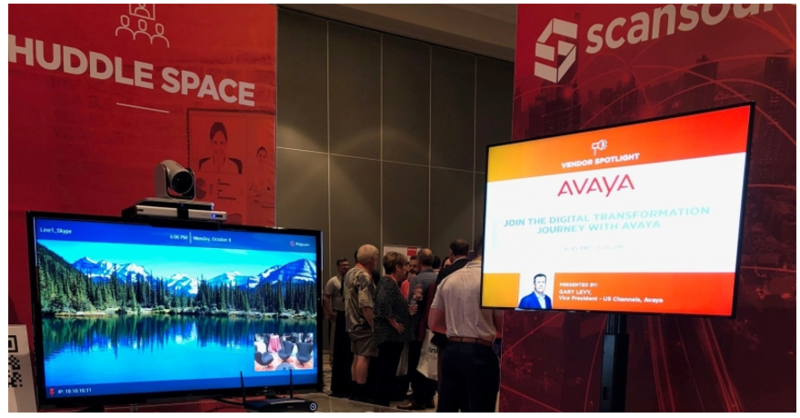 Radically different from other collaboration solutions, AvayaLive Engage connects participants from around the globe in collaboration sessions featuring 3D visuals, video and spatial audio. Multiple, free-flowing discussions can take place simultaneously, and participants can have access to and take full advantage of all materials related to the session. Avatel will be attending the Enterprise Connect 2012, March 26-29 at the Gaylord Palms, Orlando FL. This event is the leading enterprise communications and collaboration event, to see the latest solutions and analyze how you can take advantage of the dramatic changes reshaping our industry. This year marks the 22nd anniversary of this conference and exhibition. We hope to see you there. This premier conference and expo offers 40+ sessions covering the full range of platforms, services and applications. Hear top executives from Avaya, Cisco, IBM, and Microsoft at keynote sessions. Enterprise Connect is not only a great conference, it’s a fantastic exposition. In fact, The Enterprise Connect Expo is the ONLY place you’ll find ALL of the leading equipment, software and service providers in one location. Avatel Technologies believes this conference and expo is going to be an exciting and informative experience, and we look forward to seeing you there. Register today for Enterprise Connect, the leading conference and expo in enterprise communications and collaboration. The theme of this year’s event was “Accelerating Growth: The Power of We”, at the Venetian Hotel in Las Vegas, Nevada. The conference highlighted Avaya’s new branding “The Power of We” along with the Faster, Smarter, Better concept – explaining that Avaya offers what every business leader needs: technology that gets the right people together with the right information, at the right time. Customers need solutions that increase productivity and simplify complexity that provides cost savings and a maximum return on investment. As a premier partner with Avaya, Avatel supports the initiative to move from selling individual products to selling end-to-end solutions that address customer needs. Avatel believes that this approach is more proactive rather than reactive with a more consultative approach to our customers. The consumerization of IT – Tablets and mobile phones are the way people do business and the only way to participate is to provide enterprise experiences on consumer platforms going forward. The benefits of a SIP network and its interoperability, with cost savings associated with a converged voice/data network. Create flexible business collaboration in the next phase of voice and unified communications behind SIP and fit-for-purpose technologies. Virtualized communications platform for cloud computing. Create an evolving business model with SIP as a driver of the model. This is an exciting time to be an Avaya partner, as Avaya continues to position the company as the undisputed leader in business collaboration with focus on innovation and transforming customers’ infrastructures to improve their collaborative capabilities. See our products and services link for more information. The Enterprise Connect program will be broader and deeper than ever focusing on key themes including Mobility, Unified Communications, SIP and SIP Trunking, The Cloud and Virtualization, Video and Collaboration, Planning and Implementing IP Telephony, The Social Enterprise and Managing Technology, Costs and People. Connect with the major equipment and software suppliers and service providers; preview new communications systems, services and applications; and talk to the people who are developing the products and services that will be powering your enterprise communications. Enterprise Connect offers pricing packages to fit every budget. Register early to take advantage of the best rates. Enterprise Connect is being held at the Gaylord Palms Resort and Convention Center and special, low hotel rates have been negotiated for Attendees. Register today for a FREE Expo Plus pass or take an additional $1000 off the onsite price for 4-Day or 3-Day Conference packages! Enterprise Connect 2011 will help you plan, build, unify and leverage your enterprise communications. Hope to see you there! The event was held at the beautiful A La Carte Event Pavilion on December 14th and was the ideal venue for Avatel, Avaya, and other experts to offer their insight into a range of topics and issues that are of utmost importance to small businesses. Our purpose for the event was to demonstrate a clear view on the present and future of communication technology and to educate small and medium size businesses on the technologies that provide them with new ways to serve their customers better without driving up operating costs. Our guests learned how small businesses have achieved success with strong communications strategies that make it easy for their customers to do business with them, and help them rise above the competition. The technology showcase allowed the guests to connect with Avaya and other respected vendors who displayed the latest in technology. Our guests enjoyed lunch in a waterfront setting and learned how to increase productivity and efficiency in a targeted and educational setting with hands-on demonstrations. The Avatel event, titled “Prepare your Small Business for Success” welcomed over 65 customers and partners and featured new ways to serve customers better and unleash hidden productivity within small business. We explored ways for successful companies to do more with less – keeping their business flexible, innovative and competitive. 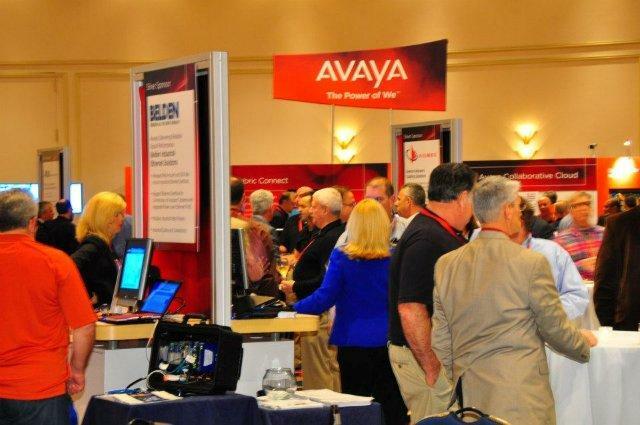 While the Small Business Summit and Technology Showcase was an opportunity for customers to learn more about Avaya’s latest products and technology, the event was also a valuable opportunity to network with other SME businesses. The educational -style event explored new ways regarding how technology is impacting and improving business. The key note presentation provided every guest with an opportunity to understand the latest Avaya developments and state-of-the-art technologies. We feel that the companies that are going to succeed are the ones that are looking closely at what drives success in their businesses and are strategically mapping technology to improve their key success factors. Feedback from the guests at the event has been extremely positive: ”Just a quick note to thank you for an excellent Technology Showcase. I was amazed at some of the new technology and I will pass along this information/brochures to our Corporate Offices in NYC & Plano, Texas. Also, your staff is well informed and easy to speak with. I hope that we avail ourselves of Avatel Products in the near future. Thank you”. Jack Van Vooren, Director of Sales and Marketing Genikon Corporation. This event was a milestone for Avatel and we would like to offer a special thanks to Avaya’s SME Vice President, Adnon Dow and Mark Massingham, the Avaya Presenter. Thanks to our great relationship with Avaya and our other partnering experts, Avatel will continue to conduct more powerful events like this in the future.